We are excited to share the auto-protection capability for SQL Server in Azure Virtual Machines (VM). This is a key addition to the public preview of Azure Backup for SQL Server on Azure VM, announced earlier this year. Azure Backup for SQL Server is an enterprise credible, zero-infrastructure pay as you go (PAYG) service that leverages native SQL backup and restore APIs to provide a comprehensive solution to backup SQL servers running in Azure VMs. What happens when you add a new database to your protected SQL Server? You need to rediscover the database and then manually trigger configure protection to backup that database. Now imagine if we take away the work from you and automatically detect and protect each new database you add to the instance. Our new auto-protection feature does just that. Auto-protection is a capability that lets you automatically protect all the databases in a standalone SQL Server instance or a SQL Server Always On availability group. Not only does it enable backups for the existing databases, but it also protects all the databases that you may add in future. You can enable auto-protection for the desired SQL Server instance or Always On availability group under Configure Backup for SQL Server in Azure VM. When enabled, all the databases for that SQL Server will automatically be selected. You can then define the backup policy for the selected databases. After you associate the policy, you can see the newly protected databases under the Backup items. Thus, if there is a significant addition or deletion of databases in your environment, auto-protection capability will save you time and effort by automatically discovering and protecting the new databases. 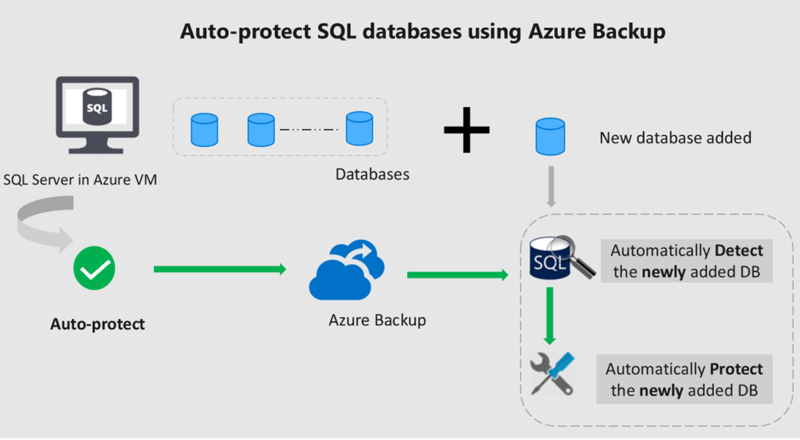 Learn more about auto-protection by referring to our documentation on Backup SQL Server databases to Azure.